They finally got the pacing down. Season 1 had that problem a lot of shows like this do where it dragged plot points past their freshness date. Season 2 has been consistently delivering enough that it doesn't feel like a tease.<br/> <br/> Mockingbird was great. I love how they can throw curveballs that don't telegraph things that comic readers would instantly recognize but do it in a way that makes sense. They finally got the pacing down. Season 1 had that problem a lot of shows like this do where it dragged plot points past their freshness date. Season 2 has been consistently delivering enough that it doesn't feel like a tease. Mockingbird was great. I love how they can throw curveballs that don't telegraph things that comic readers would instantly recognize but do it in a way that makes sense. - <strong><a href="http://robot6.comicbookresources.com/2014/11/glow-in-the-dark-shield-shirts-reveal-hidden-hydra-agents/" target="_blank">Glow-in-the-dark SHIELD shirts reveal hidden Hydra agents</a></strong> <br/> <br/><img src="http://robot6.comicbookresources.com/wp-content/uploads/2014/11/hidden-hydra1-625x312.jpg" width="95%"> <br/> <br/>This officially marks a high point for anything Agents of SHIELD related. This officially marks a high point for anything Agents of SHIELD related. Palicki and Bloolancebobbid’s characters Lance Hunter and Barbara “Bobbi” Morse aka Mockingbird have quickly become fan favorites since joining Phil Coulson’s (Clark Gregg) team early this season. Lance is a quick-witted mercenary sharpshooter, while Bobbi worked undercover in HYDRA laboratories. Giving the spinoff a Mr. & Mrs. Smith vibe, Lance and Bobbi are former husband and wife who have let sparks fly in a push-pull relationship on Agents of S.H.I.E.L.D. Marvel, ABC and reps for Palicki and Blood declined comment. - <strong><a href="http://www.comicbookresources.com/article/wait-is-ghost-rider-coming-to-agents-of-shield-after-all" target="_blank">Wait - Is Ghost Rider Coming to "Agents of SHIELD" After All?</a></strong> <br/> <br/><em>"Agents of S.H.I.E.L.D." may be doing Ghost Rider after all. TVLine reports that the Marvel tie-in show is looking to cast two brothers who sound suspiciously like Robbie Reyes, the most recent incarnation of Ghost Rider, and his brother Gabe: "a pair of Latino brothers, one of whom is always the most dangerous person in the room, the other paralyzed in a wheelchair." <br/> <br/>The report comes on the heels of a fiery Season 4 promotion, which will appear on an "Agents of S.H.I.E.L.D. "-themed train for San Diego's Comic-Con International. The design features a chain on fire, which -- in and of itself -- is not entirely unique to Ghost Rider, though it is most often associated with him; the Inhuman Hellfire, who made his debut last season on the series, also used this trick in the show. However, the casting rumor steers the ship back towards Ghost Rider.</em> <br/> <br/>I generally expect the show to do the least interesting thing, so I just assumed the rumor was stupid fan BS. Anybody actually watch the show? Can see a way Ghost Rider would fit in? - Wait - Is Ghost Rider Coming to "Agents of SHIELD" After All? "Agents of S.H.I.E.L.D." may be doing Ghost Rider after all. TVLine reports that the Marvel tie-in show is looking to cast two brothers who sound suspiciously like Robbie Reyes, the most recent incarnation of Ghost Rider, and his brother Gabe: "a pair of Latino brothers, one of whom is always the most dangerous person in the room, the other paralyzed in a wheelchair." The report comes on the heels of a fiery Season 4 promotion, which will appear on an "Agents of S.H.I.E.L.D. "-themed train for San Diego's Comic-Con International. The design features a chain on fire, which -- in and of itself -- is not entirely unique to Ghost Rider, though it is most often associated with him; the Inhuman Hellfire, who made his debut last season on the series, also used this trick in the show. However, the casting rumor steers the ship back towards Ghost Rider. I generally expect the show to do the least interesting thing, so I just assumed the rumor was stupid fan BS. Anybody actually watch the show? Can see a way Ghost Rider would fit in? I watch AOS regularly. There is indeed Hellfire to consider who did use a chain of fire leading up to the finale of Season 3 but yeah, Ghost Rider could totally work and fit the show. - <strong><a href="http://marvel.com/news/tv/26497/sdcc_2016_gabriel_luna_joins_marvels_agents_of_shield_as_ghost_rider" target="_blank">SDCC 2016: Gabriel Luna Joins 'Marvel's Agents of S.H.I.E.L.D.' 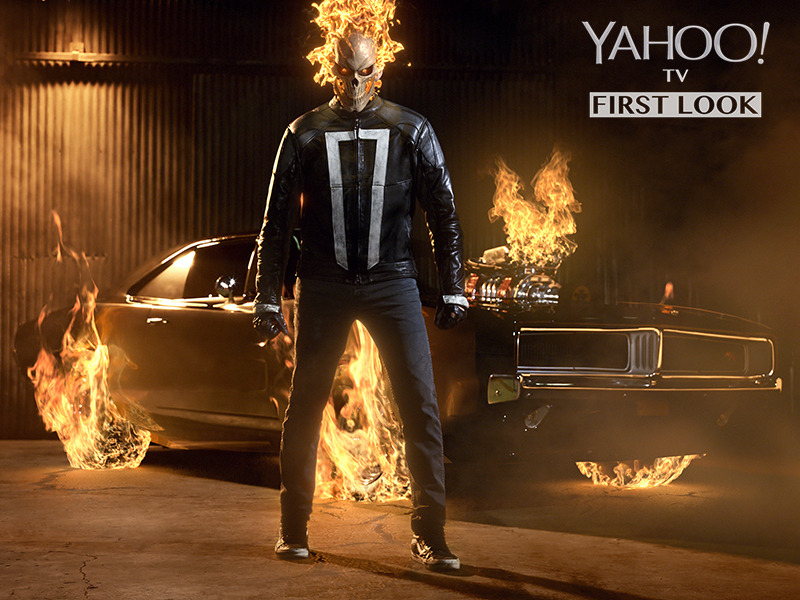 as Ghost Rider</a></strong> <br/> <br/><em>Vengeance comes to “Marvel’s Agents of S.H.I.E.L.D.” this fall at 10 pm! <br/> <br/>Gabriel Luna (“True Detective,” “Matador”) will roar into the lives of Agent Coulson and the team, as Robbie Reyes the unstoppable Ghost Rider, which was revealed today at Comic-Con International in San Diego. <br/> <br/>“Season 4 will unquestionably be the series’ biggest, most ambitious story yet, and it all begins with the introduction of one of our greatest legacy characters in Ghost Rider,” said Executive Producer/Head of Marvel Television, Jeph Loeb. “When the Spirit of Vengeance rides into S.H.I.E.L.D., it’ll change everything.”</em> <br/> <br/>Well, fancy that. It was true! That's pretty interesting! <br/> <br/>The biggest question of all -- will this one be worth watching? Gabriel Luna (“True Detective,” “Matador”) will roar into the lives of Agent Coulson and the team, as Robbie Reyes the unstoppable Ghost Rider, which was revealed today at Comic-Con International in San Diego. Well, fancy that. It was true! That's pretty interesting! The biggest question of all -- will this one be worth watching? <div class="forumQuote"><b>KenshiMaster16 Wrote:</b><br/>I watch AOS regularly. There is indeed Hellfire to consider who did use a chain of fire leading up to the finale of Season 3 but yeah, Ghost Rider could totally work and fit the show.</div> <br/>I totally forgot -- Kyle MacLachlan was on the show as Mr. Hyde, wasn't he? <br/> <br/>If he's still in the mix, they could always riff on the Ghost Rider comics to get more out of it. I totally forgot -- Kyle MacLachlan was on the show as Mr. Hyde, wasn't he? If he's still in the mix, they could always riff on the Ghost Rider comics to get more out of it. - <strong><A href="http://www.ew.com/article/2016/09/04/agents-shield-ghost-rider" target="_blank">Agents of S.H.I.E.L.D. : Get your exclusive first look at Ghost Rider!</a></strong> <br/> <br/><img src="http://www.ew.com/sites/default/files/i/2016/09/01/shieldqefw.jpg" width="95%"> <br/> <br/><em>EW has an exclusive first look at Gabriel Luna as the flame-licked spirit of vengeance Ghost Rider, who will make his debut in the upcoming fourth season of the ABC super series. <br/> <br/>“As always, we are going to put our own spin on the character,” executive producer Jed Whedon tells EW. “We are staying true to the comics in the places where we feel like it’s really important — we love the character’s family dynamic and the East L.A. kid in him.”</em> <br/> <br/>Translation: They're gonna make it lame. - Agents of S.H.I.E.L.D. : Get your exclusive first look at Ghost Rider! EW has an exclusive first look at Gabriel Luna as the flame-licked spirit of vengeance Ghost Rider, who will make his debut in the upcoming fourth season of the ABC super series. Translation: They're gonna make it lame. - <strong><a href="https://www.yahoo.com/tv/agents-of-shield-ghost-rider-charger-robbie-140139254.html" target="_blank">‘Marvel’s Agents of S.H.I.E.L.D.’ First Look: See Ghost Rider in His Fiery Glory</a></strong> <br/> <br/><img src="https://66.media.tumblr.com/8c00ddcad16bb1695eeb6a2cf21adfa5/tumblr_inline_ode9hgBZty1tdxckh_1280.jpg" width="95%"> <br/> <br/>Not sure how I feel about the more traditional skull, as opposed to the machine head he has in the comics. The eternal struggle. Not sure how I feel about the more traditional skull, as opposed to the machine head he has in the comics. The eternal struggle.